Ray Hamilton grew up in the same Dallas, Texas neighborhood as Clyde Barrow, which is where they are thought to have become acquainted. He is mentioned in several crimes with Barrow including the August 5, 1932 gunfight in Stringtown, Oklahoma in which Deputy Sheriff Eugene Moore was killed. Moore and Sheriff Charles Maxwell had become suspicious of the youths at an outdoor country dance. Bonnie Parker, Clyde Barrow and Hamilton were sitting in a car drinking moonshine when the officers tried to investigate and were fired on by the trio. Moore was killed; Maxwell would survive six gunshot wounds and Parker, Barrow and Hamilton would escape unharmed. Hamilton was born May 21,1913 in a tent on the banks of a river near Schulter, Oklahoma, a small community on US 75 between Henryetta and Okmulgee in eastern Oklahoma. His father John Henry worked in Henryetta at a lead smelting plant. The family later relocated to Dallas and Ray Hamilton would go on to a career of crime most of his short adult life. On October 8, 1932 when Hamilton was 19 years old, he robbed the First State Bank of Cedar Hill, Texas, located at 515 Cedar Street. He took the money and then locked the employees in the vault. Hamilton’s loot amounted to some $1,400. Hamilton’s connection to the Barrow Gang was publicized. Details of the robbery varied in the reports, but it is thought that no shots were fired, despite reports of gunfire. A descendant of a Cedar Hill resident at the time relates that the bank president let it be known how relieved he was that not all the bank’s cash was taken. The tale continues that when Hamilton found out about the bank employee’s statement, he decided to rob the bank again. Returning with accomplice Les Stewart on November 25, 1932 to get another $1,600, Hamilton was gone from the scene 30 minutes before the crime was discovered, though it took another hour and a half before employees again locked inside the vault were freed. Hamilton’s car broke down about a mile out of town and he was stranded until two farmers stopped to help him, only to be kidnapped by Hamilton as he made his escape. Hamilton portrayed himself as a gentlemen bandit and true to his orientation, he bought the farmers lunch before letting them go. It is thought that Hamilton’s two robberies in Cedar Hill led to the depression-era failing of the bank. Hamilton’s freedom was short lived as he was arrested later that same year for the death of John Bucher of Hillsboro, Texas the night of April 30, 1932. Bucher and his wife were awakened at their apartment above a music store by Hamilton and another man on the pretense of buying a guitar string. Once inside, the pair drew their weapons and robbed the Buchers of several diamond rings and $20 from the safe. Bucher kept a gun near the counter and was killed as he reached for it. In December, 1932 Hamiton was arrested in Bay City, Michigan for the Texas murder of Bucher. Hamilton maintained that his associate Ted Rogers was the killer, but Hamilton was convicted and sentenced for the crime. Hamilton was incarcerated at the Eastham State Prison in Lovelady, Texas when on January 17, 1934, Bonnie and Clyde broke Hamilton and four others out of the jail’s prison farm. His freedom was again short lived, however. Hamilton was recaptured and finally executed for the Bucher killing on May 10, 1935 at the Texas State Penitentiary in Huntsville, only two weeks before Bonnie and Clyde were killed in Louisiana on May 23, 1935. Though he was only 21 years old, Hamilton had reportedly accumulated prison terms amounting to 362 years. The bank building still remains in downtown Cedar Hill and was designated as a certified historic structure in 2008. 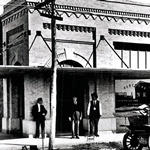 Since housing the bank, it has has been the location of various commercial ventures including a furniture store, an insurance agency, a title company, law, dental and medical offices, a gallery and currently a barber shop. Why did the Hamiltons, have such bad luck even in history, both brothers would do the crime and time, while Floyd did go to Alcatraz and tried to escape, Raymond was the poster boy for the F.B.I most wanted first poster as Public Enemy Number 1. and the first,as folk lore suggest,…. not John Dillinger who later became the poster image….West Dallas as a place in history, was the worst kind of hell hole to live and work in, it was the devils anval for the city at the time, from the 1920s and on into the 1950s, few historians made note of why, then it become history as we realize there is no more Cement City today….just images and folklore and the Hamiltons were one group that came to exist from its earthy rocky enviroment…..good story with good facts…. Yes, Floyd’s story is very interesting. They started out on the same path, but ended up so differently. one died in the chair the other became a preacher, who got off the rock too tell the story of West Dallas…..
That is a great follow up picture on the side from a recent photo shot, I gather……an out law is a person back then who ran in pace with the newpapers and the public, the great escape made the out law, the capture the end of the mistake and the beginning of doing time and forever, cast as that element or individual….. Yes, Altroup. The more recent image is one that I took a couple of weeks ago when I was down in Cedar Hill to see the former bank building. The vault is still there though the building is now a working barber shop. I believe the old teller cage and some more bank office furniture is about a half block away in a nice little museum. The picture off to the side was posted on my Twitter account. Thanks for your comments.